This was a hot and miserable race, on what seemed like would normally be a wonderful course. I know that no one likes to run in the heat and the humidity but with my asthma I just die under those conditions. It was Hazel’s first race, she was pushed along by our friend Rebecca who ran/walked the course. Lisa also ran, her first official 5k in a long time and she seems like is going to try and get back in racing shape this fall. 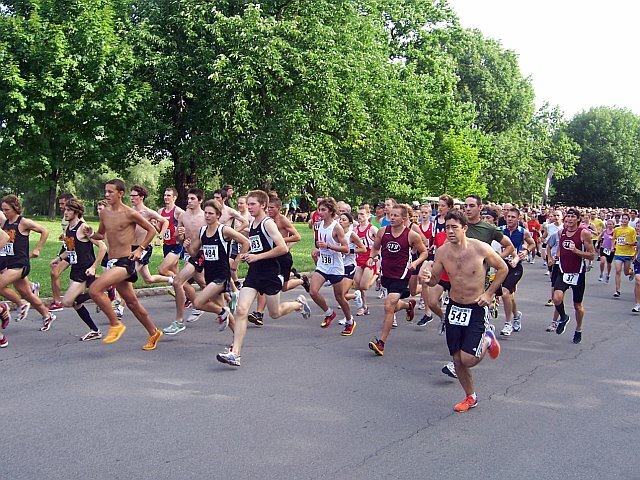 There were so many kids at this race I thought it was a high school cross country race. I guess they all wanted to get into the music festival for free. The good thing about 17 year olds and heat is that they don’t know enough to slow down in the heat. One guy (wearing 5 finger vibrams) was winning the race at 1 mile with a 5:02 split. He ended up finishing behind me and my crappy 17:14. 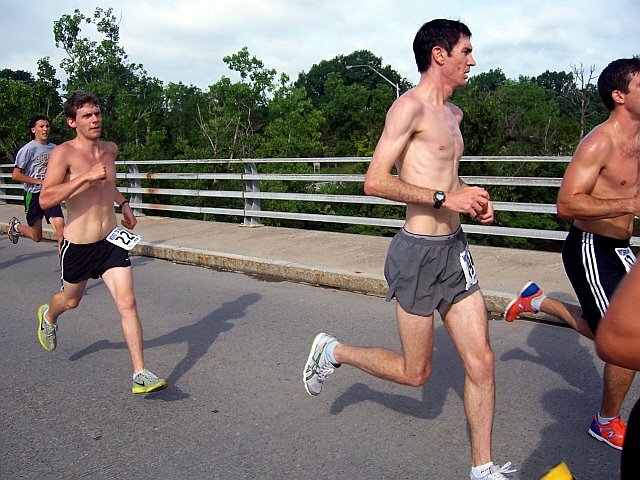 What does it say about me that even around other skinny runners I look skinny? The only really good thing about this day was that I took first in my age group which will move me up to 2nd place in the runner of year standings. I may even be able to beat Derrick Jones depending on what races he does. He is faster than me but it is all about picking the right race and I might just be able to do that. New Logo and New Runners. 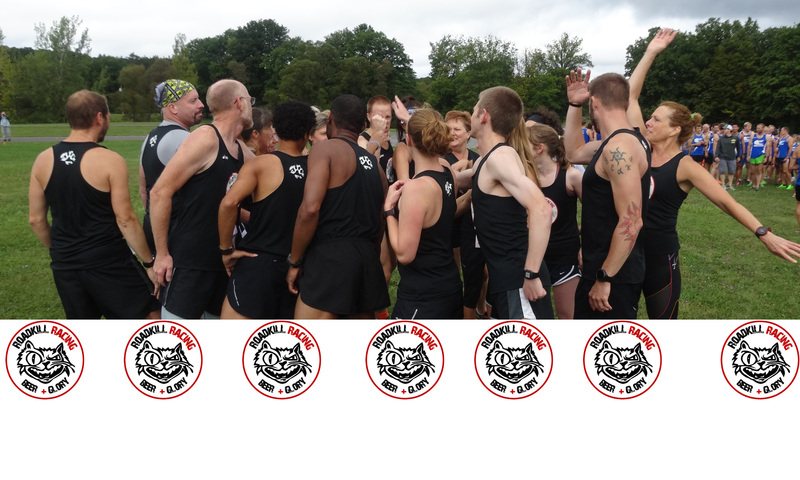 The new RKR t-shirt/singlet logo is the crazy eyed cat pictured below. Many thanks to Karyn for coming up with the design (we will have to work out some trademark and copyright deals with you). We are fast approaching the start of the fall cross country season and have added one new member Ryan Burke, but are still looking for 4-5 more runners. Any beer won by the team at these races shall be split and drank evenly amoung that days runners. For more information about joining RKR click here. Running in Santa Cruz has been pretty fun. The scenery is amazing and there are endless dirt roads and single-track trails to explore in the surrounding redwood forests. It has also been very challenging because of the terrain. I am living on the UCSC campus, which is built on the side of a mountain that slopes quickly down to the city and coast below. Every day, I am faced with a choice: run on an extreme downhill for the first few miles into town or run on an slightly less extreme uphill for the first few miles into the woods (where supposedly Mountain Lions lurk). I almost always take choice #2. I think my legs are slowly adjusting running these relentless hills, no thanks to the Santa Cruz Firecracker race that I ran over July 4 weekend. 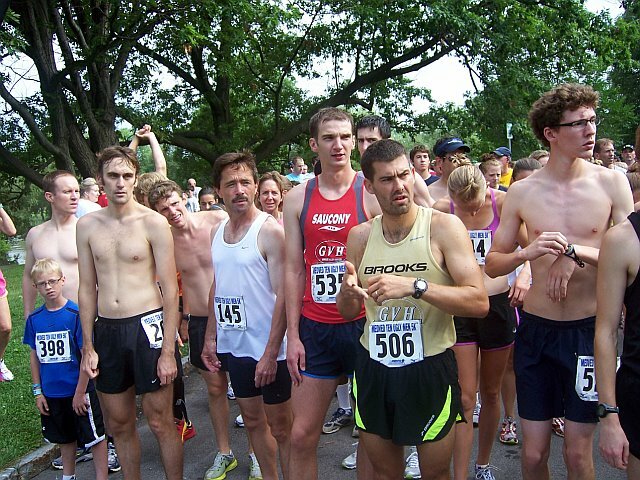 The Firecracker had a shared start for the 5K and the 10K. The 10K course was a combined road and trail race that featured, as the race brochure termed it, a “brutally long and steep hill in the middle miles.” I decided to run the 5K. I’m going to try to describe this race in the present tense. We’ll see how this goes. As the race starts, it’s impossible to tell who will be running the 10K and who will be running the 5K. After about 1/4 mile, I’m running in a tight lead pack at a reasonably comfortable pace. I figure that I’ll wait to make any strategic decisions until after the 10K and 5K competitors go our separate ways. After about 3/4 miles, we come to a T-intersection, with the following writing: “<---10K | 5K--->” The two guys ahead of me swoop left and I head right. After about 10 seconds, I realize that no one followed me. This seems strange but I keep going for a bit, slowly realizing that somehow I’d fucked it up. After a few more glances behind me, I turn around dejectedly and head back to the mass of runners who are now way ahead of me. As I run by the T-intersection again, I point at the writing and stare at a race volunteer who simply shrugs and says “That’s for lap 2!” At this point I’m pretty pissed off and upset that my $35 registration fee has gone to waste. I’m still running hard but I no longer care. Somehow, I miss the real 5K turn off (apparently it was not at the previous T-intersection, which was just leftover road paint from previous years’ race route…Brilliant!) and continue onto the bumpy 10K course and “The Hill” in my road racing flats. Great. I finished 7th in the 10K, but as a final kick in the nuts, the official race results put me down as “#661 Unknown” because I was actually signed up for the 5K. And yes, that’s a really pathetic 10K time. Overall, the Santa Cruz running scene seems OK but I’m going to withhold judgment on how well organized their races are until I’ve seen a few more (although there don’t seem to be any more during the next 4 weeks that I’m here). I met a few of the stronger runners in the race who do workouts at the local high school on weeknights, but I don’t have a car so I probably won’t be able to join them.